NEW ORLEANS – It may have taken them six weeks, but the Adams State men’s indoor track & field program is back on top. 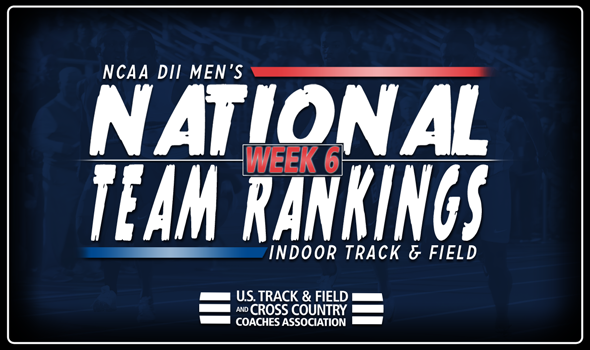 The Grizzlies are ranked first in the newest National Team Rankings, announced by the U.S. Track & Field and Cross Country Coaches Association (USTFCCCA) on Tuesday, after coming in first during the preseason poll. While only falling to 10th at one point on the season, the Grizzlies hovered around the middle of the pack before moving into third during the fourth week of rankings and remaining there last week. Despite finishing fourth at the RMAC Indoor Track & Field Championships, Adams State put together some dominant performance. The distance medley relay team ran a 10:07.54, good for an NCAA Division II Automatic Qualifying Mark, while George Kelly’s time of 4:12.27 in the mile was also an Automatic Qualifier. Tiffin fell out of first place into second after a runner-up finish at the GLIAC Championships that saw the Dragons notch five top-10 Descending Order List marks. Colorado Mines also slipped one spot to third, but did pick up the RMAC Indoor Track & Field title this past weekend. Rounding out the top-five this week was two teams who jumped two spots each in Texas A&M-Commerce (fourth) and Pittsburg State (fifth). The Lions took home the Lone Star Conference title after five top-10 Descending Order Marks were hit, including DeVontae Steele’s NCAA Division II leading triple jump mark of 16.03m (52-7¼). The Gorillas won the MIAA Indoor Track & Field Championships on the heels of five top-10 Descending Order List Marks, as well. Justice Burks’ 60 hurdle time of 7.90 is an NCAA Division II Automatic Qualifying Mark. With the two aforementioned teams jumping up in the rankings, two teams had to fall. Ashland dropped from fifth to sixth, while Grand Valley State dropped three spots to seventh. Academy of Art posted its highest ranking in program history at eighth this week after Mobolade Ajomale put on a performance for the ages. The product out of Canada broke his own NCAA Division II 200 meter record at 20.67 while also running the fastest 60 time in NCAA Division II this year at 6.63. The redshirt-junior also helped the program’s 4×400 relay team run a 3:12.42, good for seventh on the Descending Order List this season. Texas A&M Kingsville returned to ninth after coming in at that spot during the preseason poll. The Javalinas finished third at the Lone Star Conference championships. Missouri Southern rounded out the top-10 after a four-spot jump to 10th. There is only one more week of rankings ahead of the NCAA Division II Indoor Track & Field Championships take place in Pittsburg, Kansas, on March 9-10.